Franz Clement (Franz Joseph Clement) was an Austrian violinist, pianist, composer, and conductor born on November 17, 1780 (Beethoven was 10 years old.) 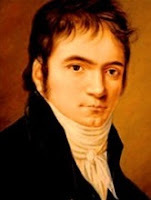 He is famous for having commissioned (and premiered) Beethoven's popular violin concerto (December 23, 1806.) A gifted violinist from a very young age, he was known for his ability to play music from memory after only briefly viewing it. Sometimes, he would alternate his virtuoso performances with circus-like displays, such as playing a piece on one string while holding the violin upside down. It was said that his playing was neat, elegant, delicate, and tender. It was also effortless. He appeared to handle the most extreme difficulties with ease. Though he was a very successful touring virtuoso and conductor for a time, he seems to have gone into a premature decline and was soon earning an average living not in keeping with his potential. He composed six violin concertos, among many other works. Were it not for Beethoven's monumental concerto, he would almost certainly be forgotten. However, because of this lucky break, everywhere the concerto goes, he goes too, never to be forgotten. It is said that he sight read Beethoven's concerto at the first performance. Some musicologists think that is debatable since Clement and Beethoven were close friends. It can easily be imagined that Beethoven let Clement try out a page or two every time he paid a visit. Nevertheless, it is quite possible that Clement played the concerto without once rehearsing with the orchestra since Beethoven was working on it up until the time of the performance. Clement died on November 3, 1842, at (almost) age 62. By the way, the portrait accompanying this post is that of a young Beethoven, not Franz Clement.